J&K: On Friday, Curfew clamped in all the 10 city of Kashmir in the view of Friday Prayers in the valley which see large congregations in the mosque. In the fresh violence in the valley of Kashmir, 36 people lost their life and above 3100 injured in the violence against the killing of terrorist Burhan Wani. 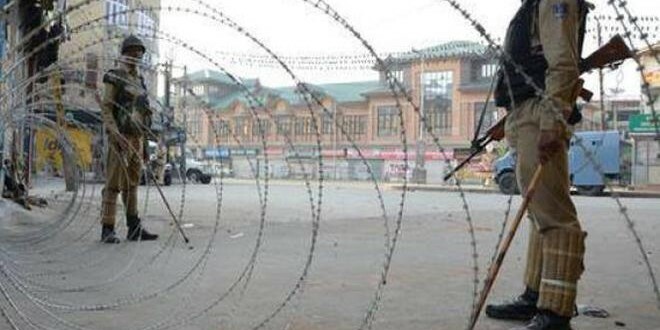 A Police officer said that Curfew imposed in the 10 city of kashmir to maintain the law and order in the valley. There was no major clash was reported on Thursday from anywhere in Kashmir.Since last Saturday, the uneasy calm prevailed with normal life remaining disrupted. More Paramilitary forces and Police personnel have been deployed across the valley for strict implementation of restricted orders. Authorities also suspended the mobile services and internet service in the valley to prevent any false rumours. Officials said that only BSNL postpaid connections are working in the valley. Small numbers of mobile phones were kept functional as most of government and police officials use the mobiles service. In the violent clashes with security forces, 36 persons including a policeman have been killed while 3,140 persons including 1,500 security personnel injured. The annual holy Amarnath Yatra also suspended on Friday as to maintain the law and order in the valley and to protect the pilgrims from the voilence. A seniour official from Jammu said that No Yatri was allowed to move Bhagwati Nagar Yatri Niwas in the Jammu to the valley on Friday. The annual holy Amarnath Yatra started on July 2 this year and around 1,45,000 pilgrims have had ‘Darshan’ inside the Cave Shrine which is situated 3,888 metres above the sea level.